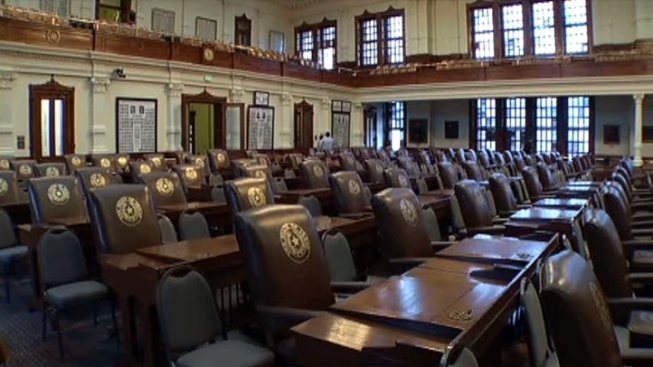 Complete coverage of the Texas Legislature. The Texas Legislature may not be spending quite like a drunken sailor, but lawmakers have certainly got the checkbook out as they work on the next state budget. Following the Great Recession, lawmakers slashed spending in 2011 for schools, health care and just about everywhere else. The cupboard is full this year with the comptroller predicting the state will raise $101.3 billion, and the Republican-controlled Legislature is spending almost every dime available without busting the constitutional spending limit. This week the Texas House is expected to pass the latest version of the next two-year budget, which will come in at about $93.5 billion -- a more than 15 percent jump above the budget signed by Gov. Rick Perry two years ago . The extra dollars this time around were made possible by a thriving oil and gas industry and a recovering economy. And yet after six years of budget cuts, many say Texas needs to spend even more. The left-leaning Center for Public Policy Priorities estimates that just to maintain the current level of government services would cost $97 billion, because of population growth and inflation. The budget that the Texas House of Representatives will debate on Thursday also fails to restore all of the $5.4 billion the Legislature cut from public schools in 2011. The bottom line, there is something for everyone to hate in the proposed budget. Conservatives will decry the increase in spending while liberals will complain the Legislature has again cut funding for children, the poor and elderly. But there will also be room for politicians of all stripes to claim some victories. In 2011, Republicans whittled the general revenue in the budget down to $81.2 billion. But they left a lot of bills unpaid, so this this year have they've tacked on $6.6 billion to the current budget, and budget-writers in the House want to add at least $765 million more. Spending extra funds this year gives Republicans some political cover for the boost in spending over the next two years. Since all calculations are based on what the Legislature actually spends in this biennium -- not what was budgeted in 2011 -- the boost in spending this year allows lawmakers to spend even more over the next two years. For example, the Texas Constitution limits the amount the Legislature can spend to the expected rate of economic growth, which is 10.71 percent over the next two years. Since the Legislature will likely spend $88.5 in this budget cycle, the cap for 2014-2015 is $97.35 billion. Gov. Rick Perry and Lt. Gov. David Dewhurst have both said that limit is not good enough. They have promised to limit government spending to Texas' population growth plus inflation, which is forecast to be 8 percent in 2014-15. As long as they stay under $95.58 billion, they will claim to have passed a conservative budget. Democrats have repeatedly called on the Legislature to spend more on public education, and they will likely claim some victories. House budget-writers want to restore $500 million to the public education budget this year and another $2.5 billion in the next budget -- still less than what was cut in 2011, but better than nothing. Rep. Jim Pitts, the chief budget-writer in the House, hasn't ruled out adding more. "The more I talk to the House members, it is the priority of the Texas House, both Republicans and Democrats, to restore public education," the Waxahachie Republican said. Yet Democrats are unlikely to win much more money. If you take the $101.4 billion, subtract the $7.8 billion spent in the current budget and the $93.5 billion that the House is expected to approve on Thursday that leaves only about $98 million left over. Democrats have called on the Legislature to tap the $12 billion Rainy Day Fund to make up for the 2011 cuts in public education, but Republicans don't appear interested. Republican leaders want to use some of that money to start a $2 billion water infrastructure fund and set aside at least another $1 billion for roads. They also plan to spend that money in a way that it doesn't show up as part of this session's budget, which would take them over the constitutional spending limit. After the House passes the budget on Thursday, it goes to a conference committee, where lawmakers will hammer out a final version before the session ends on May 27.